AFTER hearing a "ruckus", Agnes Water's David Molony saved a huge moth from becoming a toad's dinner. Mr Molony said it was the first time he'd ever seen such a a moth of that size and he couldn't stand-by and watch it be eaten. He pulled the moth from the toad's mouth and posted a photo on Facebook . Queensland Museum senior curator Chris Burwell said he thought it was a female giant wood moth. 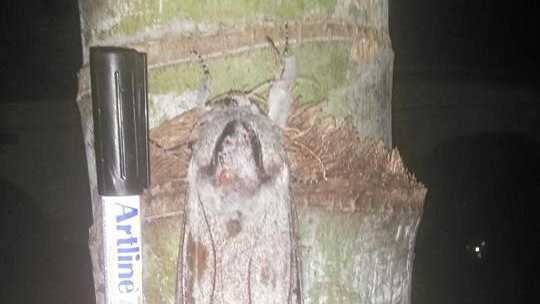 "If you know what to look for, their caterpillars, which bore in the trunk or larger branches of eucalypts, can be relatively common, but I wouldn't say that you come across the moths themselves all that often," he said. If there's an extraordinary animal in your backyard, email a photo to emma.reid@news-mail.com.au.